Side scan sonar is one of the most effective tools for underwater exploration because it can search a large area quickly and produce a detailed picture of anything on the bottom, regardless of water clarity. When looking at a side scan image it appears as if the water has been removed and the operator is getting an unobstructed view of the ocean floor, lake bottom, or river bed. High resolution images are sent from the towfish to a topside computer (included with the system) for display and storage. Fishers SONAR VIEW software gives the operator complete control over the systems operating parameters. Choose between 10 different scan ranges and 8 color schemes to display images. Connect a GPS and position coordinates are automatically captured with the side scan data. Point the mouse on a target and the GPS position coordinates for the target are displayed on the screen. Low frequency (SSS-100K) units have excellent long range (up to 600m, 1,200m swath) and produce a very good image when scanning with a 50 meter to 600-meter range setting. When operating a low frequency unit in the short ranges (below 50 m) images can be seen but lack the sharpness as seen in the longer ranges. In addition, low frequency units do not see soft targets very well (old wood shipwrecks, drowning victims, etc.). 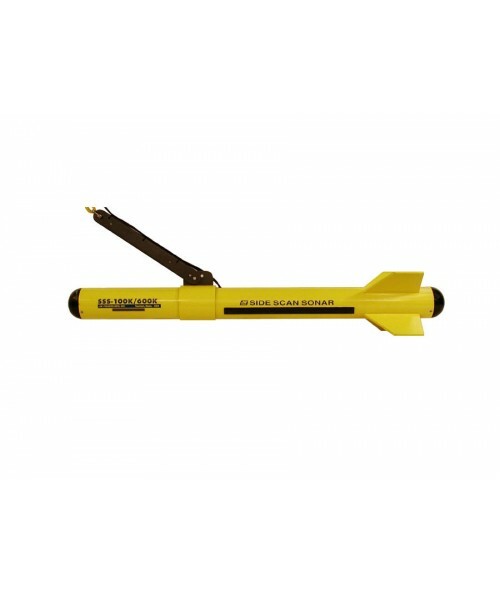 The SSS-100K is an ideal tool for large scale general search applications such as searching for shipwrecks, locating pipelines, rocks and reef structures, large propellers, planes, cars, etc. The range settings in meters are: 10, 25, 50, 75, 100, 200, 400, and 600 meters (each side). The very high frequency SSS-1200K side scan produces excellent high resolution images when scanning with a 5 meter to 25-meter range setting. 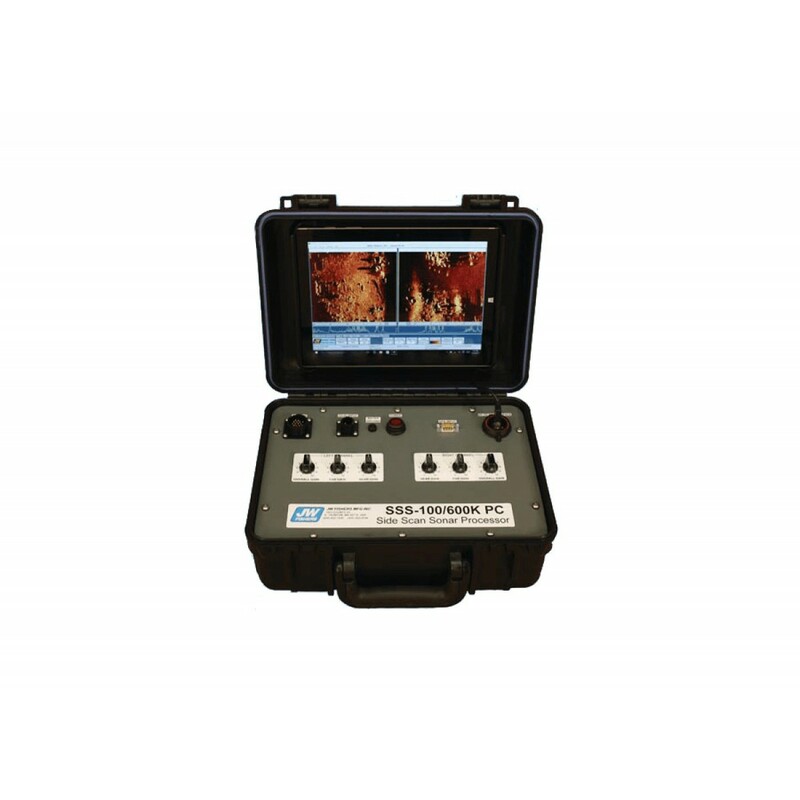 The SSS-1200K is ideal for law enforcement and dive rescue operations or any operation that requires a very high resolution image. It produces very high resolution images at ranges up to 25m (50m swath). 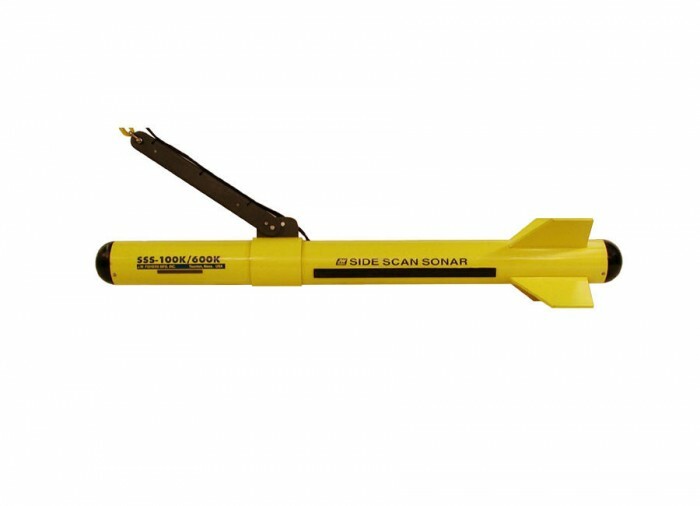 This very high frequency sonar can show very small, and very soft targets in high detail. The limitation of the 1200K is only it's shorter range as compared to lower frequency side scans. The range settings in meters are: 5, 10, 15, 20, and 25 meters (each side). The SSS-1200K is best used as part of a dual frequency system such as SSS-600K/1200K where the 600K is used for the search and the 1200K is used for making final close in passes on the target. 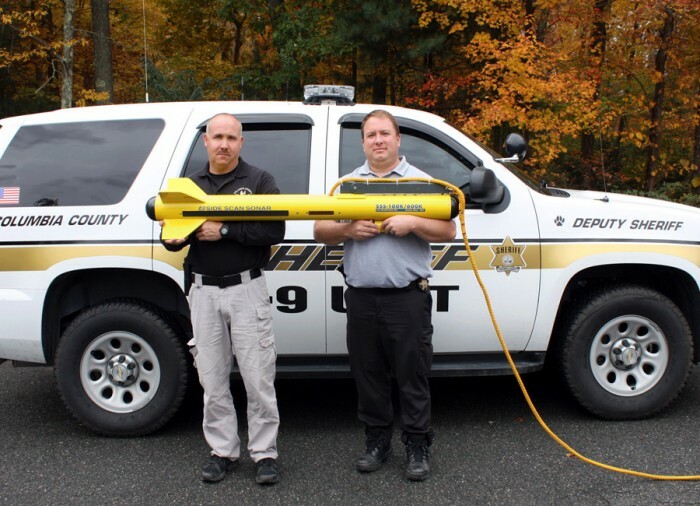 Side scan sonars are one of the most sought after, and effective tools for underwater searches. The reason; they can cover large areas quickly and “see” what’s on the bottom regardless of water visibility. 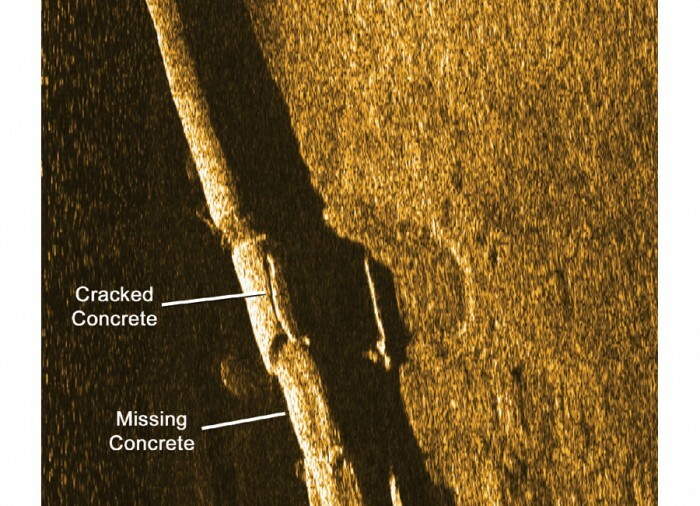 A side scan finds things by sending out a sonar beam which sweeps over the bottom, reflects off any object laying on the bottom, and returns to the towfish. The received signal is sent through the tow cable to a topside display. The displayed image is a highly detailed two dimensional picture of the ocean, lake, or river bottom and any objects lying there. The sonar beam is transmitted and received by transducers mounted on each side of the towfish. How the transducer is constructed determines the frequency of the sonar beam. Side scans with low frequency transducers have excellent long range capability, but low resolution at shorter ranges. High frequency systems have higher resolution, but very short range. 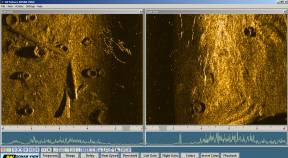 A dual frequency side scan has high and low frequency transducers in the same fish to give the best of both systems; long range and highly detailed images at the shorter ranges. JW Fishers sonars represent a major price / performance breakthrough in low-cost side scan systems. Fishers offer three different frequency side scan systems; the SSS-100K, the SSS-600K, the SSS-1200K and a dual frequency system consisting of any combination of the above frequencies. The SSS-1200K system is ideally suited when maximum resolution (detail) is needed. It can see anything the 600K and 100K can but in sharper detail. It is most effective when used with a dual frequency system such as SSS-600K/1200K. The 600K locates the target and the 1200K makes a close in pass for a high resolution image. 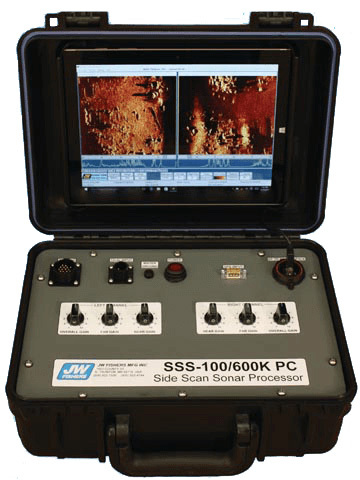 The SSS-600K is ideally suited when high resolution is needed. It is ideal when searching for small or soft targets. Applications for the 600K include: searches for old wooden wrecks, scattered debris fields, ghost nets, logs, drowning victims, mine countermeasures(MCM) by the military, and a variety of other targets. It can also locate larger targets such as sunken vessels at ranges of up to 250 feet. 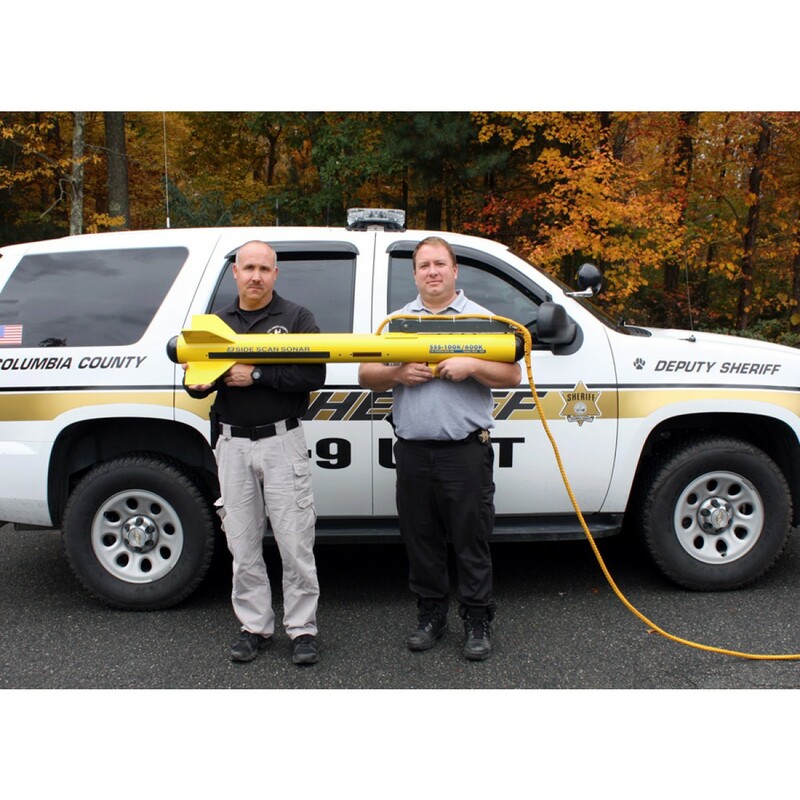 The SSS-600K is in use by law enforcement agencies, dive rescue groups, and military units worldwide. 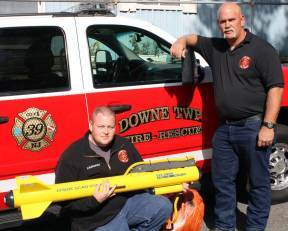 Fire and police departments consider side scan an essential piece of equipment for their dive teams. Sonar can save hours of dive time and dramatically increases the safety factor. 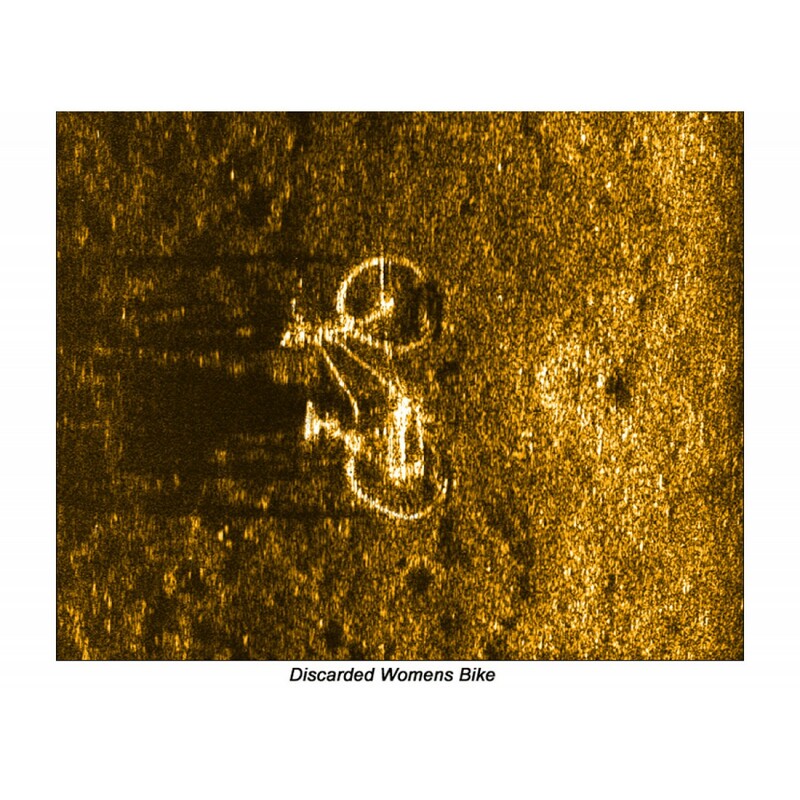 Towing the sonar over an area produces a detailed map of the underwater terrain so divers know exactly what's down there before entering the water. Even in zero visibility environments the clarity of the image is the same. A limitation of conventional side scan systems is they look only at the bottom; but a rotating transducer option on Fishers sonars let them scan vertical structures as well. 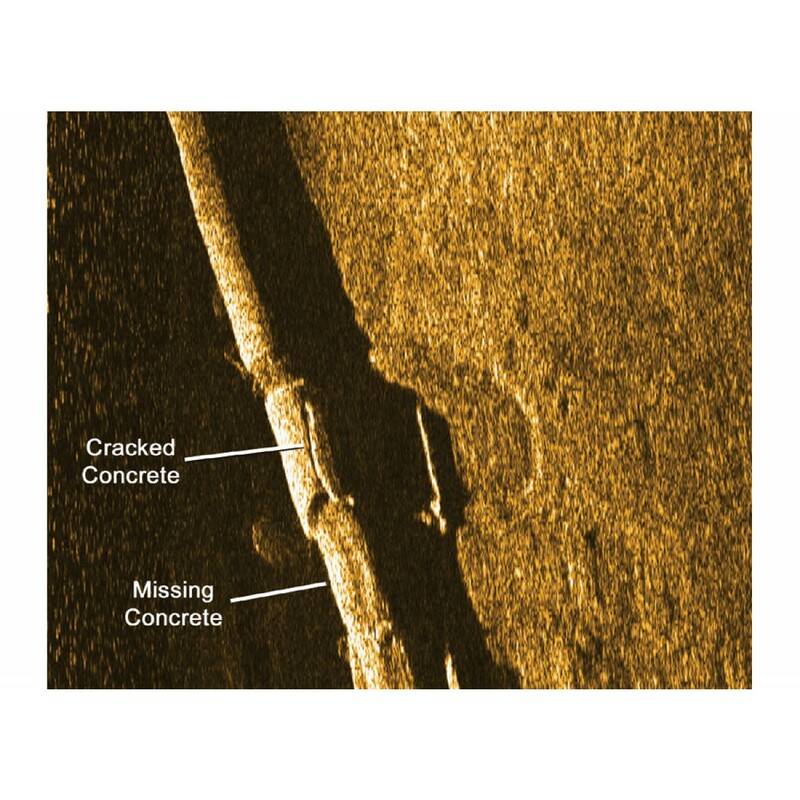 This means a team can survey the face of a dam, seawall, pier, bridge support, or ship's hull to look for damage or any "unnatural" device like an explosive that may have been attached to the structure. A significant number of state emergency management agencies and sheriffs departments have received homeland security grants to acquire this equipment to aid in the protection of ports and crucial infrastructure. The SSS-100K has much greater range than the higher frequency systems, but less resolution at the shorter ranges. 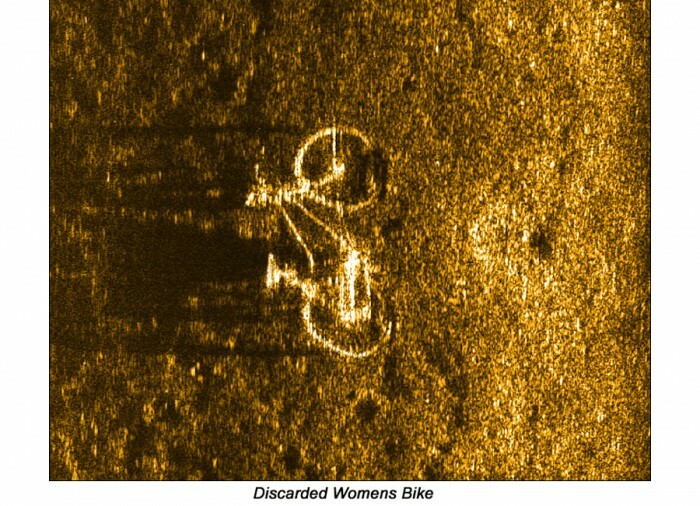 The 100K has a range of 600m (2,000 feet/4,000 foot swath) for targets like large sunken ships. 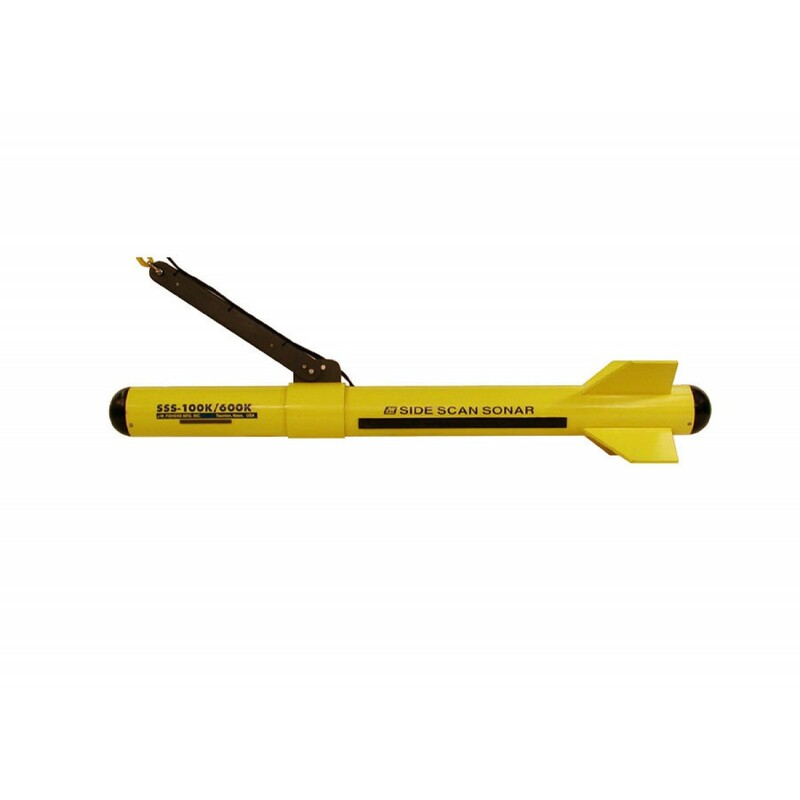 This system can also locate smaller targets like outboard motors, anchors, snowmobiles, large propellers, and other small, but “hard” targets. In addition to locating shipwrecks other common applications for the SSS-100K are finding vehicles submerged in lakes and rivers, searching for downed aircraft, locating sunken fiberglass boats, and tracking pipelines. Dual frequency side scans have all the capabilities of the individual high and low frequency system with both built into one towfish. Select the high frequency when searching for small or soft targets, and the lower frequency when the longer range is needed. Operator can switch from one to the other at any time during the search operation. But for general searching the SSS-100K/600K is recommended. For search and rescue or scientific work the SSS-600/1200. Fishers side scan towfish is designed for maximum stability, so surface waves and rocking of the boat will have very little impact on the signal being transmitted and received. The fish can be towed at any speed, however, 1 to 3 knots allows for maximum information gathering to produce the highest quality images. All of Fishers side scan sonars come with a 500-foot depth rated towfish, 150 feet of cable (Kevlar reinforced), a laptop computer, a GPS, and Fishers SONAR VIEW software. The computer displays a real time color image of the ocean floor. The screen is split down with the middle with the right side showing the ocean bottom on the right side of the vessel, and the left side of the screen shows the ocean bottom on the left side of the vessel. The SONAR VIEW software gives the side scan operator complete control of all system functions with easy to use pull-down menus and icons on the screen. Size measurement tool, target height off bottom, annotation, and auto bottom tracking all standard. The operator can change colors, ranges, amplifier gain, and other controls with a click of the mouse. With the computer, side scan images can be stored in memory for playback and post processing at any time in the future. Small file sections including screen shots can be copied for emailing. With the GPS connected to the computer the position coordinates are captured with the side scan data. Once GPS is connected, the mouse cursor can be placed on any object on the screen and its position coordinates will be displayed. Sonar files can be stored on the computer's hard drive or to DVD. An optional Sonar Coverage Mapping feature shows the boat's path as it travels over the search area and the sonar coverage swath. It's all displayed on a grid with latitude and longitude as the X and Y axis. This option makes it easy to search even large areas and ensures no part of the area is missed. The map can be shown in a separate window on the same screen as the side scan image, or the map can be displayed on a separate monitor. The user can also control the size of the map. The map can be exported as an image with a KML file to allow it to be easily overlaid on other mapping programs (as shown at the right). All data can be stored on the PC hard-drive or disk. 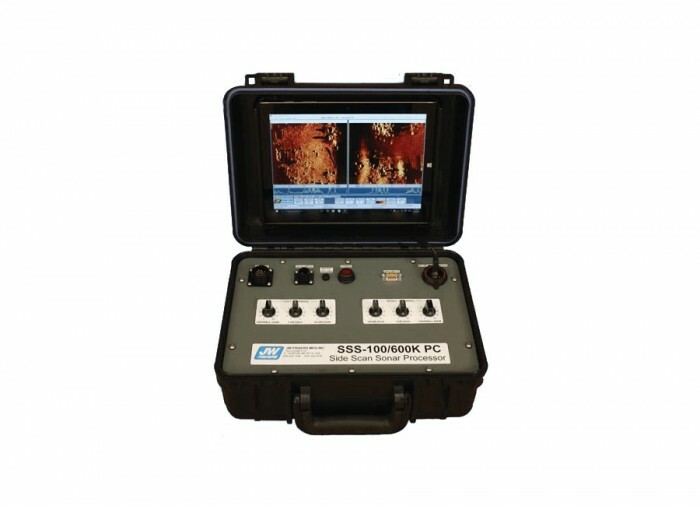 Portability, rugged construction, low cost, and ease of operation. 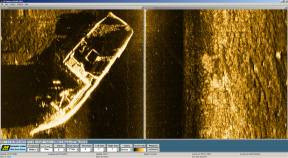 Larger towfish ensures stability and provides high quality sonar images. Dual frequency has both high and low frequency transducers in one towfish. Computer and software included with system. 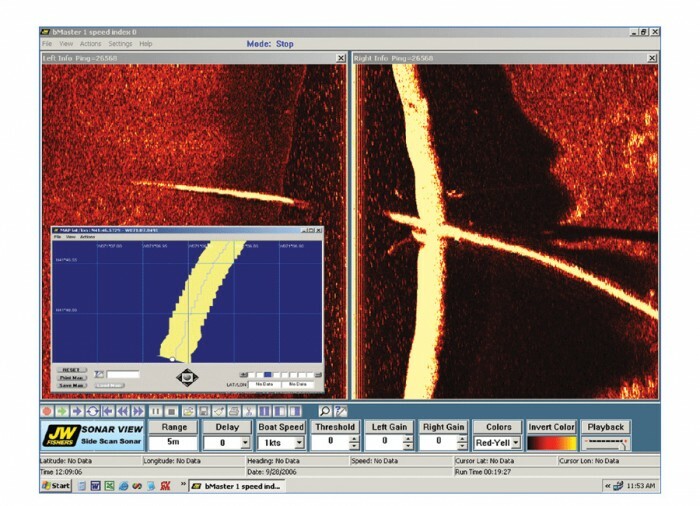 Fishers SONAR VIEW software provides user with lots of flexibility in displaying and manipulating sonar images. Each side scan system is backed by Fishers exclusive, UNCONDITIONAL TWO YEAR WARRANTY. The display area is split down the center with each channel making up half of the screen. The right side of the display is a picture of the bottom on the right side of the tow vessel, and left side of the display is a picture of the bottom on the left side of the tow vessel. The transmitted sonar signal is made of high-energy pulses which form a very narrow (1 degree) beam. This beam sweeps across the bottom resulting in a continuous stream of returning echoes. The echoes return to the transducer and are sent topside to the Sonar Processor which produces evenly spaced samples. The samples are displayed in a horizontal line on the computer, where each line is series of tiny dots. What dot color is displayed depends on the strength or amplitude of the returning echo. When the complete line is printed, the transducer sends out another signal and the process repeats. As the towfish moves forward through the water each new line is laid down beside the previous line, creating a picture. 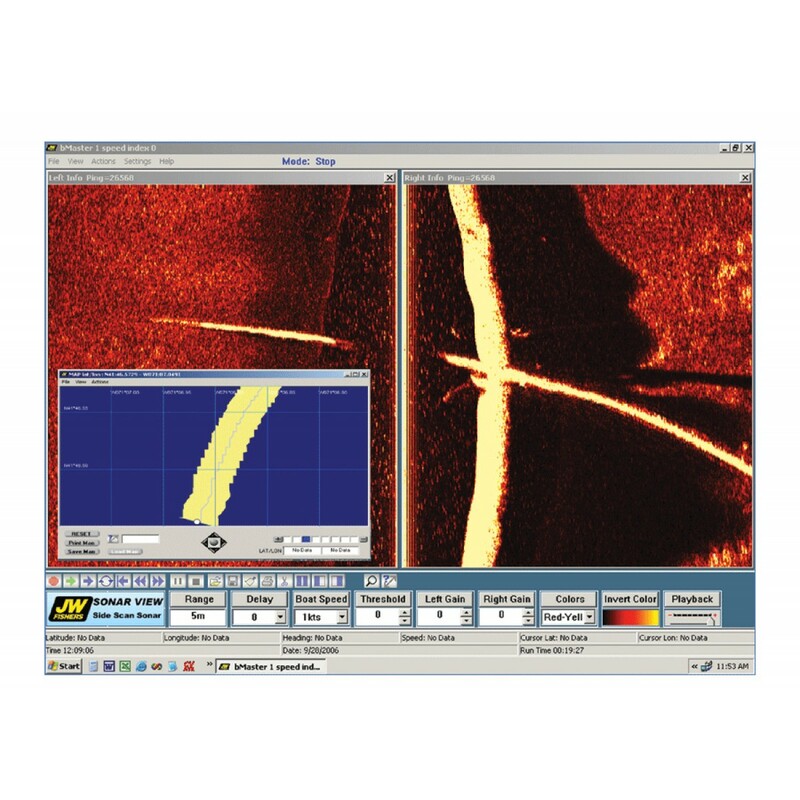 Fishers SONAR VIEW software (included with side scan, see separate data sheet) give the operator complete control. Most of the operating parameters are selected through easy to use pull down menus on the screen. The computer displays real time color images of the sonar data. The operator can change colors, ranges, amplifier gain and various other system controls during operation. Side Scan data can be stored (XTF format) in memory for playback and additional post-processing. Small file sections including screen shots can be copied for emailing. A sizing tool allows the operator to determine the size of targets and a zoom feature makes it easy to enlarge targets. The operator can determine the height off the bottom and annotations can be added and saved. Printouts of side scan data can be made on any standard printer from stored data. The XTF format and output signals allow for interfacing with 3rd party software (Hypack, Chesapeak, etc) for mosaicking and additional post-processing. All data can be stored on the PC hard-drive or disk. When the GPS (supplied) is connected to the computer, the position coordinates are captured and stored with the sonar data. When the cursor is pointed at a target on the computer screen, the GPS coordinates for the target are automatically displayed.